Visitors exploring NMWA’s third-floor galleries may find themselves near two similarly shaped sculptures. 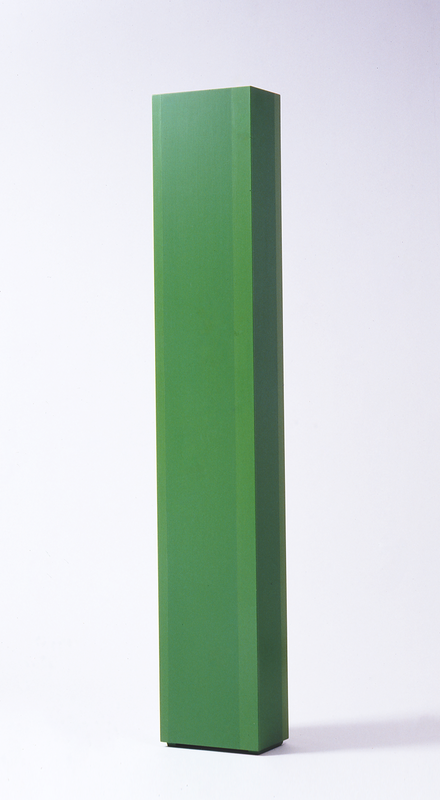 Artists Louise Nevelson (1899–1988) and Anne Truitt (1921–2004) worked within different art movements but employed a similar column structure in their sculptures. Viewers can compare and contrast elements of the artists’ respective styles. 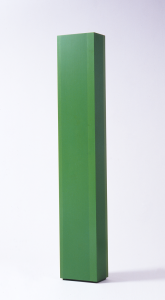 While both works are abstract, it is interesting to investigate the progression from Louise Nevelson’s 1959 Abstract Expressionist work White Column (from Dawn’s Wedding Feast) to Anne Truitt’s 1971 Minimalist take on the column in Summer Dryad. Both artists’ works set them apart in primarily male-dominated art movements. Nevelson (b. 1899, Kiev) rose to prominence as an Abstract Expressionist sculptor whose works also included a strong Cubist element. Nevelson developed her signature style of large, monochromatic assemblages to rival the scale of the canvases that many male Abstract Expressionists painted. 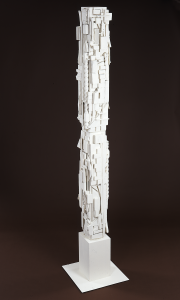 As Nevelson began to gain recognition, she was deemed unworthy of the attention by one critic, who stated, “We learned the artist is a woman, in time to check our enthusiasm…otherwise we might have hailed these sculptural expressions as by surely a great figure among moderns.” Nevelson continued to develop her practice, and as the scale of her sculptures grew, so did the respect of critics. 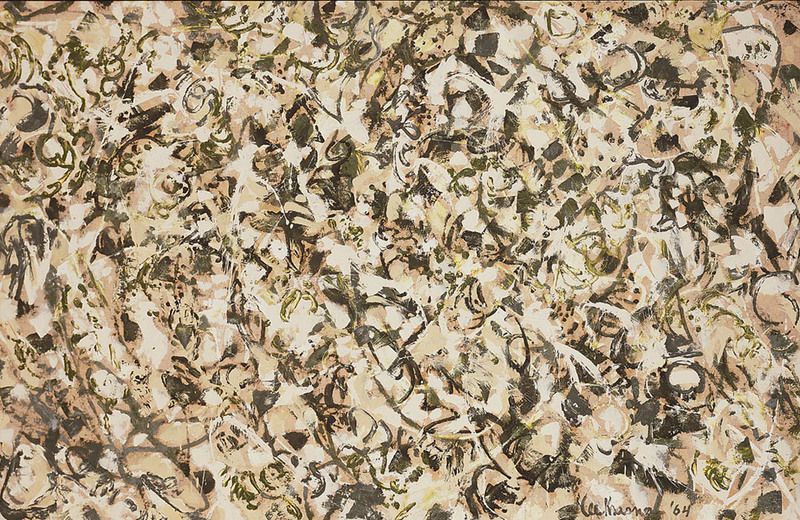 In a response to Abstract Expressionism, the 1960s saw the rise of Minimalism. Abstraction was pushed further into flatness and non-representation. Truitt (b. 1921, Maryland) created her sculptures with the geometric simplicity that characterized Minimalism. Truitt made the style her own and separated herself from male artists through her use of expressive titles. Unlike most Minimalists, Truitt’s titles reference some level of iconography in her work, but she denies any direct representation, unlike Nevelson’s abstracted wedding figures. Color plays a key role in each artist’s process. Both Nevelson and Truitt use color to evoke emotion and draw in viewers. However, the artists employ different palettes. Truitt’s works contain bright hues while Nevelson chose to envelop her works in matte shades of white or black. Before coating Dawn’s Wedding Feast in a serene white, Nevelson primarily worked with black paint to communicate a feeling of enormity. 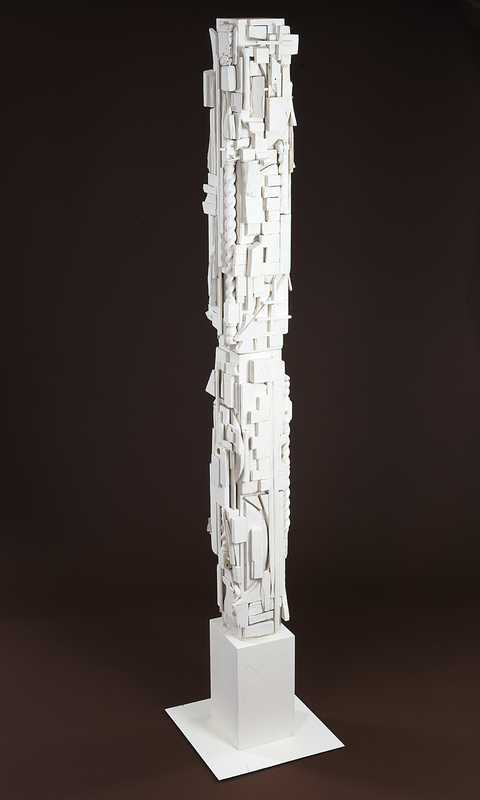 White Column was created as one many sculptures meant to immerse the visitor in a white “wedding” in her installation Dawn’s Wedding Feast, part of the Museum of Modern Art’s 1959 exhibition 16 Americans. Truitt applies multiple layers of paint to her geometric sculptures, creating clean, smooth surfaces. While her works vary in color, Summer Dryad’s bright green hue calls to mind elements of nature in the warmer seasons. Visit NMWA and see these sculptures in the museum’s newly reinstalled collection galleries! —Meghan Masius is the winter/spring 2017 publications and communications/marketing intern at the National Museum of Women in the Arts.